Do you have a question about the greatest game played with a ball? Send it to Dr. Zimet at MDHandball@hotmail.com. For more articles (and additional mental strategies) go to www.WPHLive.tv, menu option ‘Wrap Around’. This seemingly innocent question has stirred a great deal of debate. Since it strikes to the heart of the Perfect Game, I will be responding in two editions of Wrap Around. If you have a story to tell about the state of Handball in your area, please feel welcome to email me! Unfortunately, the question “How many people are playing handball?” can only be answered indirectly. The data that exists – such as membership numbers and tournament attendees – can’t be used to make valid prevalence estimates. Let’s take swimming as an example. In the spring of 2016 there were 83.5 million Americans who went swimming, but of these only 460k (.005%) were members of USA Swimming or US Masters Swimming. In short, it’s likely that an unknown, and possible sizable, number of handball players have no association with national organizations such as the USHA or WPH. We do know one thing. Larger demographic studies that include the 50 most played sports don’t mention handball, which suggests a small enough group that these samples fail to capture even a single one of us. What we can address are two issues important to an analysis of handball. First, and the topic of this edition, assessing the current state of sport and exercise to help us understand the landscape in which handball exists. Second, we will look into sport systems, or the infrastructure of sport, to explore how sports are effective in their growth. Kids’ cardiovascular fitness has declined in the USA by 6% every decade since 1975. In a mile run, kids are about 90-seconds slower than the same aged kids of 30 years ago. Overall, kids are 15% less fit than their parents were as children. Childhood obesity rates have tripled since the 1980s. In 2013 about 17% of U.S. children and adolescents were obese. Almost 60% of kids ages 6-12 in the USA play no sport at all, and the number of kids who play on a regular basis has been declining since the turn of the century. The situation for adult health is just as bleak. More than 50% of adults in the United States are considered inactive or low-active, and an additional 30% fail to meet recognized minimal guidelines for aerobic and muscle strengthening activity. This is a huge problem, since sport and physical activity have been shown to support greater mental health, delay cognitive decline, reduce numerous physical health related risk factors, increase self-esteem, energy, and sleep quality, and contribute to an overall higher quality of life. Nor is this a universal problem. Australia and the Netherlands started programs directed at increasing adult activity. The Netherlands has a 66% sport participation rate for folks over 16, and in Australia 59% of adults participate in a physical activity at least three times a week. Sport participation peeks in adolescence and then decreases at a fairly steady rate. The older we get the less we exercise. While sedentary childhood behavior predicts a sedentary adult lifestyle, an active childhood does not necessarily predict an active adulthood. However, past experience in sport/exercise exposure remains the single strongest predictor of adult sport participation. People who attend PE/Gym are two to three times more likely to have an active lifestyle. People who attend more school (i.e., more educated) are more active as adults. Dropout rates go down for people that play sport for fun and recreationally, as compared to playing to win or competitively. The more lifestyle transitions a person experiences the more likely he or she will abandon exercise/sport. Team sports are most frequently played by minors (e.g., American football), while adults tend to gravitate towards individual sports (e.g., golf) that often lead to fitness and outdoor activities (e.g., walking, swimming) in later adulthood. Exerciser or athlete? Adults who exercise most often report doing so for health reasons. Adults who play sports most often report doing it for personal enjoyment and challenge. Why is it that, despite the obvious and well documented benefits, few adults exercise or play sports? Although important, I prefer to concentrate on the positive with this question: who are these adults who continue to play sports well into their adulthood, and why do they do it? Why people don’t exercise or play sports: Adults give many explanations for their sedentary habits. A majority of non-exercisers feel too busy to fit exercise or sport into their schedule. Many sedentary adults don’t feel fit enough to start exercising, or fear getting injured if they got back into sport. They may compare themselves unfavorable to their peers and fear being embarrassed. Others feel discouraged by injuries and the myriad of physical issues that nag at us as we age, or lament the loss of youthful vitality. Additional reasons include negative past experiences, cost, a cultural sentiment that ‘sports are for kids’, being unaware of available resources (e.g., what to play and where), and vicarious engagement or passive participation (e.g., fandom and offspring elite sport participation). Unfortunately, fandom fulfills a need for three things that sport would prove: comradery, competitive engagement, and community. I was fascinated to find evidence that only 22% of non-exercising adults stated their sedentary behavior was due to a lack of interest. These ‘aspirational exercisers’ reported that having someone who would get them involved, such as a friend, would be a strong motivator to try something new. I believe the answer to why people play sport lies at the heart of why sport exists in the first place. Sport is play; play that’s been organized for the purpose of fairness and universality. While what play looks like changes over time and between cultures, it is an instinctive and universal joy that transcends our species. Sport and overall well-being. As indicated previously, exercise has massive health benefits. However, research offers even more evidence that sport provides value above and beyond exercise alone. The field of Positive Psychology, which studies well-being, addresses five factors as critical components to our overall state of wellness: Positive emotions; Immersion; Relationships; Meaning; and Achievements (PIRMA). Exercise and overall physical health has been shown to increase positive emotions as well as decrease feelings of stress and depression. Immersion refers to the feeling of ‘losing yourself in an activity’, or getting so involved in something that you lose track of time and self. Every athlete knows what it’s like to get lost in the thrill of competition! Sport is a venue for forming relationships, and many people turn to sport as the means for connecting with friends. Communities often come together around sport, although sadly this has become increasingly true for fandom rather than participation. People develop deep passion about sport. Sport gives us the chance to connect with our heroes, friends, family, and the past. The meaning people make of their sport of choice is often an integral part of their identity, and it’s not unusual for someone to connect sport to questions like “who am I?” Unlike most things we do as adults, sport offers clear and fair opportunities for achievement. Additionally, achievements in sports feel great because they’re earned and can be easily explained to anyone else who understands that sport. Sport also offers a wide range of achievement opportunities, from the small (e.g., making your first par) to the large (e.g., shooting par for a round). Now we know more about the landscape of sport and exercise and are better prepared to think about the second question; namely, how do we go about getting people involved in sport, and how do we keep them involved despite the range of barriers leading to drop-out? These questions on the infrastructure of sport systems, as well as a look specifically into handball, will be addressed in the next issue of Wrap Around. Albert Apuzzi, Brooklyn NY. B. 1955. Handball Hall of Fame, Twenty National Open 1-wall titles, 32-time Open finalist. Prefers 1-wall small ball. One-wall handball is alive and thriving in NYC. Big ball has been increasing because quite frankly it is more user friendly. It’s easier to play, gentler on your hands, less expensive, tournaments do not require membership, cash awards are not limited to pro divisions, etc. Social media and video sharing sites are having a direct negative effect on participation and on site spectatorship. Players used to join because they wanted a t-shirt or planned on spectating anyway. Now it’s simply too easy to get real time results and view live. I’d love to see some handball associations answer this question. Simply to know if they are aware and taking action or if they are in the dark. There are a good number of young people around the country that participate in junior and intercollegiate tournaments. The problem is retention. Handball thrives in places where social activity is part and parcel with the game. Whether it’s a bunch of players hanging around to have a few beers or going out to dinner, the camaraderie is a key element in the retention of players. It takes commitment on the part of establishment to welcome youngsters and make them a part of handball society. I speak from experience. Young men who started in elementary school and are now in their 20s, working and supporting families, continue to play because they interact with older adults inside and outside the courts here in Tucson. This is not rocket science, its common sense. It can work anywhere with a little marketing and commitment. Fiona Shannon, Belfast Ireland. B.1978. 9 Irish National Open titles, 2 US National Open Singles titles, 3 Worlds Open titles (3 Singles, 2 Doubles), 18 All Ireland senior titles. Prefers 40×20. I think the development of Irish handball is so good as its promoted really well throughout all the counties in Ireland. Numbers have definitely increased with the one wall that’s easily accessible to schools which introduce the children from a young age. The recognition and achievements of the likes of Paul Brady and indeed myself in my day helps also, as the young kids coming through the ranks can see what’s achievable and strive to be as good as, if not better. Handball is not dying, just the four and three wall versions are, and have been for a considerable time! In contrast, one wall big blue is taking off in a big way all around the globe, especially in New York. The central problem all along has been that the handball world has devoted all of their money and attention on promoting and featuring 4-wall, despite the sad fact that the general public just doesn’t want to either watch or play 4-wall. As a result of this closed mindset, our sport has been on a slow death spiral for the last 40 years or so. Please don’t miss-understand what I am saying, I am not speaking to the intrinsic value or beauty of any particular form of the game. I am only referencing 4- walls general appeal to the broader public. Let’s face it, it’s played with a ball you have to chase after, moving 50 or so m.p.h. that’s as hard as a rock inside a small white cube. Sound like a good time, right?? Additionally, the ball is too small and moves to fast to be seen on camera, and for beginners or casual fans, it just hurts too much to even hit the ball moderately hard to be in any way enjoyable. If handball was ever to have a broader appeal, its only hope was in the one-wall version as played with the big blue ball. For me, this 4-wall centric mindset had very personal negative consequences. Despite my records and longevity, I was always pushed to the sidelines. 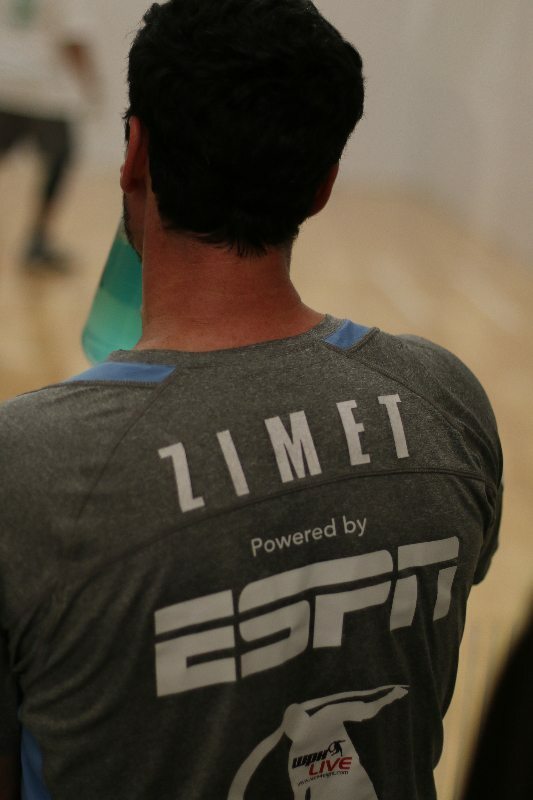 I had a 25-year run of unequalled greatness in both small ball and big blue, singles and doubles, as well as more national media attention than any other handball player with the exception of the great Jim Jacobs. Yet no one knows this because they were about 1-wall and not 4-wall. I was given 4 full pages in the largest sports magazine in the world – Sports Illustrated – right in the front of the magazine, and it was never even mentioned in the Handball Magazine. I was on national prime time TV on numerous occasions, with 20 minute features on my life and handball achievements on CBS and NBC, and again, not one single word. They went out of their way to suppress both one wall’s greatness and awareness of my own athletic prowess because they only cared for 4-wall, and sadly, we are all living with the results of that closed mindset and failure of leadership. Cesar Sala, Bronx NY. b 1977. Six National Open 1-wall titles (2 singles & 4 doubles), 1 Worlds Singles small ball. Prefers 1-wall small ball. The game of handball is growing overall and the future seems bright but there are a few things that need to be addressed in order for things to stay the course. Growth is often painful and filled with hills and valleys. In the end, we enjoy the ups and endure the downs together. We have to remember why we’re playing this game and how we can maintain the bridges that we’ve made over the years. The age divisions are the key to keeping the game thriving and maintaining its history while enjoying where the game is now. I’ve had discussions on how we can grow the game and why certain numbers have gone down and others have gone up. There’s a lot of reasons for this, like the connections between players and how we maintain those relationships. When people feel connected and engaged in what they’re doing then their passion grows. When your passion grows then your willingness to work grows. People enjoy putting work into something they feel connected to. Our common goals bind us together. Unfortunately, there are a lot of things that can disconnect us like illness & personal struggles. The age groups in particular will always be directly impacted by this. That’s why we have to make sure to include and take extra care of those players in the age divisions. In my opinion they’ve been neglected too often and it’s hurting the game. Most organizations cater to youth programs and clinics to teach new players the game as well as the pro divisions. That has to continue but not at the cost of respecting and keeping the interest of the older divisions. That is where you’ll find the true riches of our game and its history. I remember watching the masters, seniors & other age divisions and really getting more out of those matches over any other. Each generation offers its own unique perspective and style on how the game is played based on who they are as people. Many of the spectators who truly enjoy watching the games are former players themselves who love handing down their knowledge of the game while critiquing their predecessors. Most players prefer being on the courts so that’s where the age divisions come into play. I love reconnecting with guys like Albert Apuzzi, Paul Williams, Dan Flickstein and Al Torres who was a national champion the year I was born! I had the privilege of playing Al Torres and squeaking out a win by a single point when I was coming up and I felt great about it. He was 50 years old! Not to mention he was probably playing in several age divisions while still playing in the open. When I heard about Dan Flickstein retiring from competitive play it saddened me a bit but I’m sure he has good reason to do so. But I know his presence as a player will be missed. I remember Flickstein as a dean at my high school as well as my handball coach. I’m sure all players can relate to the feeling of nostalgia we have when we see each other at events. All of the great memories we’ve shared over the years are shared at these events. Whether it’s 4 wall, 3wall or 1wall we all need to stay connected making sure we keep encouraging players to compete in all divisions. How else can we share these memories without having all of the stages of our wonderful game showcased at our events? I’m confident there are players that will think back to these days as they share their memories of the beautiful hills and valleys of today. Those ups and downs strengthen our bond and enrich our lives. I love handball, it’s players and all involved in our great sport.